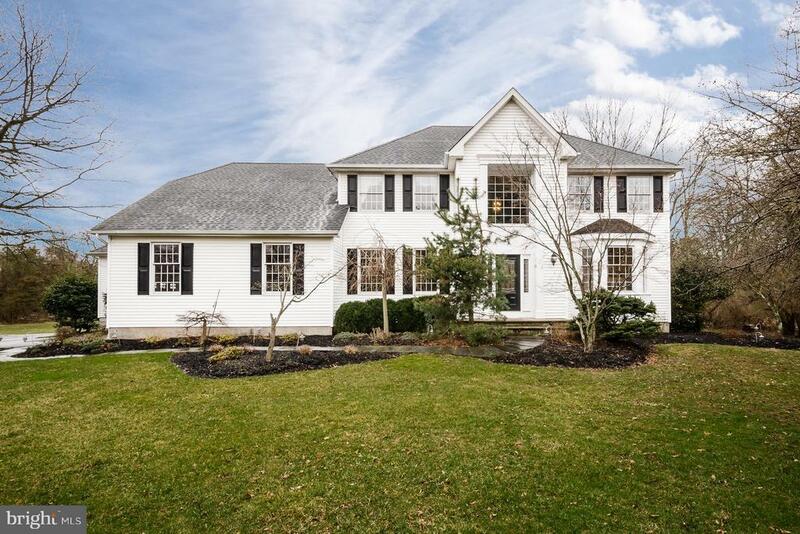 Picture perfect with plenty of curb appeal - this beautifully appointed Colonial is set on a lush 2.15 acres. Hardwood floors and a soaring foyer welcome you into this well-maintained home featuring an accommodating floor plan with elegantly staged rooms featuring crisp white trim and contemporary paint palette. A generous dining room and living area with gas fireplace make entertaining a breeze. The updated kitchen offers granite topped oak cabinetry including a work station and island, decorative backsplash and stainless steel appliance package. With easy flow into an inviting family room with one of the 3 fireplaces and elegantly appointed dental molding and custom window valences. Ample windows throughout provide plenty of natural light. On the main level an in-law suite is the ideal space for long-term guests or family with lovely sitting area, bedroom and full bath- would also make a fantastic playroom. Upstairs three bedrooms share a full bath while the generous Master boats a private office/sitting area behind French doors, deep walk-in closet with custom organizer and luxurious bath with dual, granite topped vanities. Sliders off the kitchen reveal a patio area and the expansive grounds beyond - yard of manicured grass for hours of enjoyment. And lets not forget a fabulous finished basement level for plenty of additional recreation space! Nothing to do but move-in with peace of mind knowing that this home has been provided with a whole-house generator for any inclement weather that may occur.